I’m all for wearing cute gear and general cuteness on the farm. I always do a little five minute face even if it’s just me and my husband and our cows. A girl has to feel lovely. If you don’t believe that, give yourself five minutes of face and get back to me. Zélie, like my two other girlies, is into shoes. All shoes, any shoes, any shoe-like item will be used as shoes. 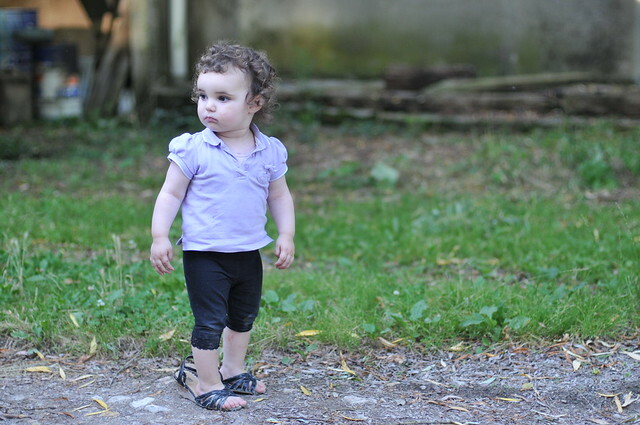 Her first word was, “shoes.” Today, on our evening walk, she chose the wedge. I was a bit skeptical as I thought she might abort and move to bare feet. I love children in bare feet, but I’m still working on “project tidy” which includes rusty nails and their spikey tetanus inducing friends. She saw it through as any Cosmo girl would. She walked all over the farm in her oversized wedges without issue. Cats were cuddled. Chickens were fed. Balls were thrown. I’ve done a little wedging myself on the farm, but I reserve it for more domestic tasks. A wedge has no business with cattle work. I love reading your blog!! I always get excited when I see one waiting in my inbox! You make farm life so interesting to read about. Thank you!!!!! Well said, hermanita. Zelie has not fallen far from her parent’s shoe tree. By the way have you ever seen that shoe tree? It is on one of the roads going east from Oregon. It is amazing.